The second edition of the book on language comprehension in honor of Pim Levelt's sixtieth birthday has been released before he turns sixty-one. Some things move faster than the years of age. This seems to be especially true for advances in science. Therefore, the present edition entails changes in some of the chapters and incorporates an update of the current literature. I would like to thank all contributors for their cooperation in making a second edition possible such a short time after the completion of the first one. Angela D. Friederici Leipzig, November 23, 1998. Preface to the first edition Language comprehension and production is a uniquely human capability. We know little about the evolution of language as a human trait, possibly because our direct ancestors lived several million years ago. This fact certainly impedes the desirable advances in the biological basis of any theory of language evolution. Our knowledge about language as an existing species-specific biological sys­ tem, however, has advanced dramatically over the last two decades. New experi­ mental techniques have allowed the investigation of language and language use within the methodological framework of the natural sciences. 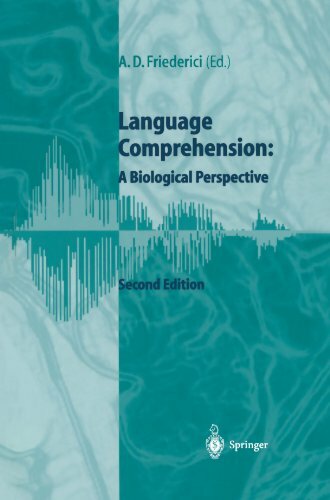 The present book provides an overview of the experimental research in the area of language com­ prehension in particular.